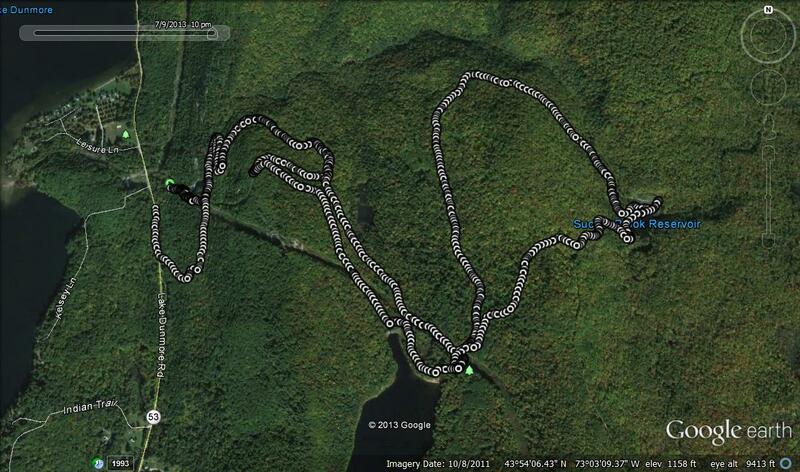 For this run, I am returning to one of my favorite destinations, Silver Lake, the pristine pond perched on the hillside about a mile and a half above Lake Dunmore. I have noticed, and blogged about some sections of the pipeline connecting Silver Lake to the small hydroelectric plant just south of Branbury State Park. So, I thought it would be fun to follow this pipeline from start to finish, and this required that I start the run at the smaller unmarked parking lot just past the small bridge immediately south of Branbury Park, rather than the usual Falls of Lana parking lot. Beginning in this lot, I immediately headed towards the clearing where the pipeline completes its journey down from Silver Lake, and scrambled, rather than ran on the unmarked but easy to follow footpath which ascends alongside the pipeline. 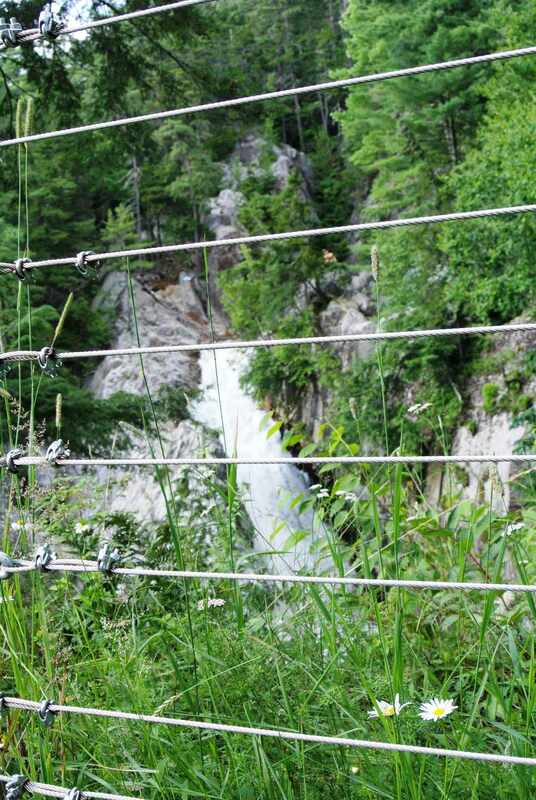 While the terrain really wasn’t good for true running, this ascent, rather than the more heavily traveled double track path most frequently used, had the advantage of an excellent view of the longest cascade in the tiered series of drops constituting the Falls of Lana. The area around the falls is a very cliffy, ledgy area with numerous opportunities for injury, so I found it interesting that of all the viewpoints, this was the only one with fencing to protect errant runners. Shortly after this overprotective fencing, I joined the main trail, where I had the option of bushwacking up the steep hill, literally following the pipeline in what would be a steep scramble, or actually following the normal trail and rejoining the pipeline further up the hill where it ran a more runnable course. I chose the latter, and ran up the main Silver Lake trail for about a mile until I reached the point where a major trail broke off to the right, meeting up with the pipeline at the point where the tall venting tower easily seen from below juts out from the mountainside. 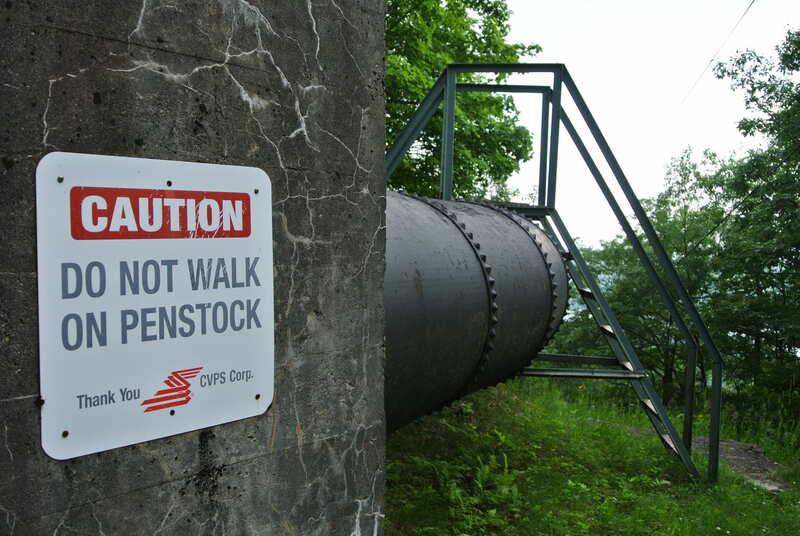 Here, reading the signage, I learned a new word – “penstock” apparently what I had been calling a pipeline is also known by this noun as well! I also noted, the sign warning of dire consequences for walking on the penstock, right alongside a ladder used for…..climbing on the pentock! From this point on, I had the opportunity to follow the penstock/pipeline across more level terrain, and in fact, the running was easiest right across the top of it, as long as I was careful not to trip over the bulges where segments of pipeline were jointed together. Much of this section was flanked by ferns, until I reached a point where the brush had been recently cleared. This portion of the run concluded at the base of the Silver Lake dam, Yes, Silver Lake, like Lake Dunmore, is a naturally occurring lake which has been enhanced in size and utility through the use of damming. Unlike Lake Dunmore, which was enlarged for recreational use, Silver Lake has more practical purposes – hydroelectric power and flood control! Climbing to the top of the Silver Lake Dam, I followed the easy lakeshore path, until reaching the small beach, before taking the spur trail heading to the hike-in campground alongside this very scenic lake. At a small footbridge over a sluiceway, the second, less well known segment of this hydroelectric project becomes apparent. 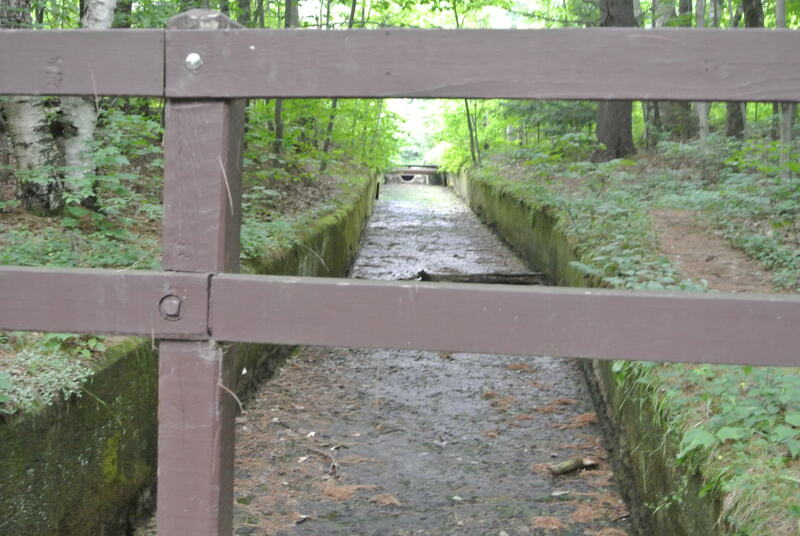 I was also surprised to see that this sluiceway, for the first time in my memory, was devoid of water. My suspicion was that with the incessant rains of the last month, water was being withheld or diverted to keep water levels in Silver Lake and/or Lake Dunmore at safe levels. I tried to follow the side of this sluiceway, but the footing at it’s edge was not quite secure enough, so I doubled back and found a small trail which brought me back to the main Silver Lake trail/dirt road, and followed it up the hill for a few yards, reaching the point where the sluiceway submerged beneath the road from my right, and at this point I noted a small building to my left whose function was undoubtedly connected to this segment of the pipeline. I turned back into the woods at this point, mostly running along the high berm covering the pipeline, although in some sections, it seemed to submerge, rendering the trail more level. The running through here was very nice for about a mile, but the trail disappeared into the semi-open hillside eventually. I followed the cleared section paralleling Sucker Brook, but for this short stretch it was once again more of a bushwhack than a trail run, but this rough section only went on for about a quarter of a mile, when it joined a maintained dirt road which climbed up the hill in front of me. This wound its way up the hill to the little known body of water known as the Sucker Brook reservoir, not to be confused with the much larger Sugar Hill reservoir, which confusingly, is the further upstream source of Sucker Brook – got that? The Sucker Brook reservoir, which feeds this highest section of pipeline, and in turn, Silver Lake, has been more of a stagnant swamp than a pond in all of my previous visits, but the recent rains have swollen this body of water to the point that it was actually a rather pleasant place! 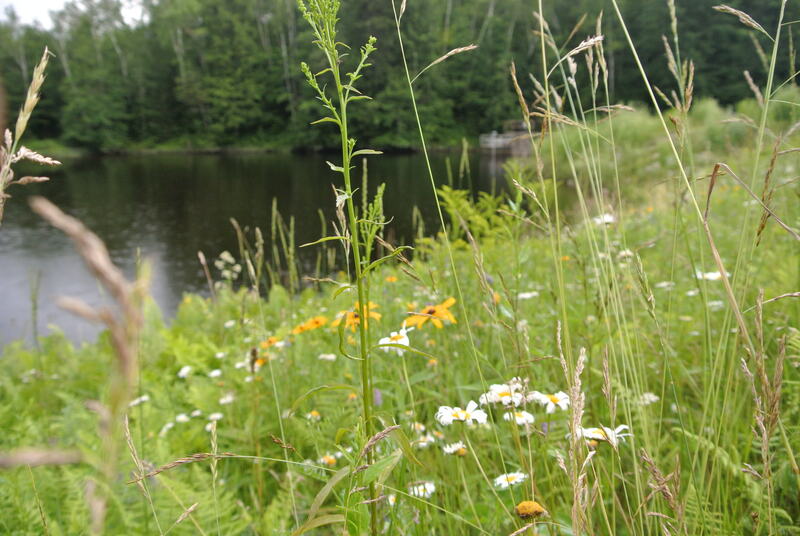 The light rain on its surface, and the early summer daisies (my favorite wildflower!) starting to wilt as the midsummer Black-Eyed Susans came into bloom made for an attractive shoreline. Continuing across the earthen dam forming this reservoir, I came to a surprise – a sign, in the middle of nowhere, telling the history of this dinky little pond! A fun fact – this small body of water was created in 1917, and at the time was the highest altitude earthen dam east of the Mississippi. Who knew? Especially since most outdoorspeople don’t even know it exists! 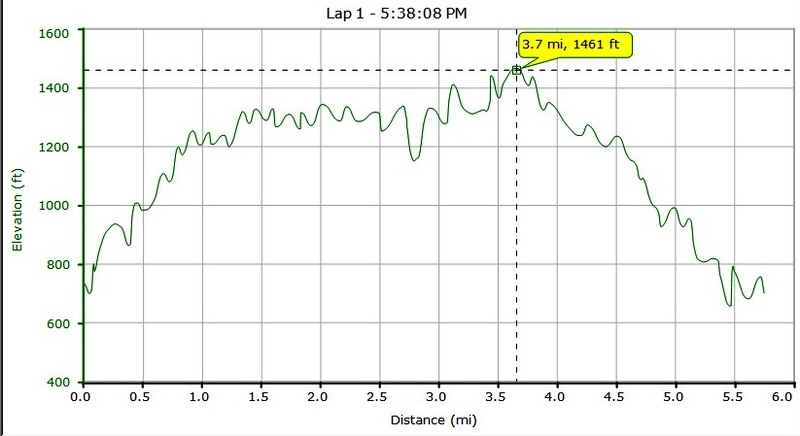 The run continued up a steep incline for a few hundred yards, until it joined the Silver Lake trail, and at this time, I decided I’d had enough of pipeline traipsing, so I took the easy way back to my car by taking the path of least resistance down to the Falls of Lana parking lot, and from there a short quarter mile run to the minor parking lot where my car was stowed. Overall, this was indeed a rather pleasant run, with a few short bushwacking or scrambling sections, a healthy dose of mud, and about 700-800 feet of climbing and descent in its 5.75 miles.